In a large bowl, cream together the butter and sugars with an electric mixer on high speed. Add the egg and vanilla and beat until smooth. In another bowl, combine the flour, salt, baking soda, and cream of tartar. Pour the dry ingredients into the wet ingredients and mix well. Preheat oven to 300 degrees while you let the dough rest for 30 to 60 minutes in the refrigerator. In a small bowl, combine the sugar with the cinnamon for the topping. Take about 2 1/2 tablespoons of the dough and roll it into a ball. 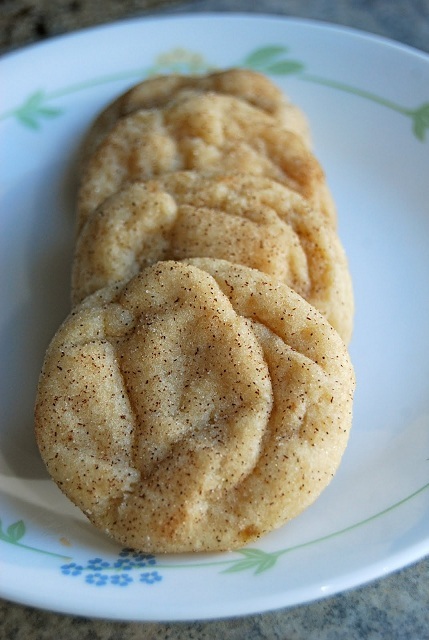 Roll this dough in the cinnamon/sugar mixture and press it onto an ungreased cookie sheet. Repeat for the remaining cookies. Bake the cookies for 12 to 14 minutes and no more. The cookies may seem undercooked, but will continue to develop after they are removed from the oven. When the cookies have cooled they should be soft and chewy in the middle. When you roll these, they are ginormous; they are slightly bigger than a golf ball. When you flatten them out slightly before baking, when they bake they become even bigger – huge cookies. Some might want them smaller….so just roll a little less of the cookie mixture – trying half the amount.